Modern Southern-US menu with a wide selection of cocktails, New Zealand wines, and craft beers. Live Entertainment 5 nights a week. Great service, live music - excellent cocktails! Music a wee bit loud. Chicken, carrots/waffles, roast beets all to die for. Nice cocktails. 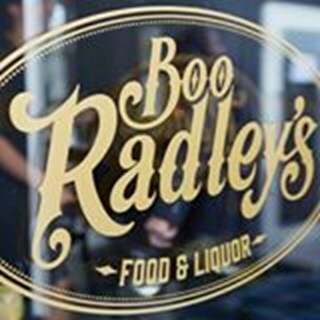 I love dining out at Boo's - The atmosphere, food and service are always top notch! This time was no different. The choice of entertainment is always enjoyable within such an intimate setting - Love Love Love it all! What a cool wee place! Food was lovely and service was exceptional - friendly and fast but not rushed. Music was slightly too loud for our liking but otherwise it was a great experience. Delicious food and wonderful service. Would definitely recommend and will be back! What a great evening we had! Service excellent, food very tasty!! Awesome food, excellent drinks menu and great service..Loved it! We will return soon. Had a Grab One for my birthday, chefs choice platter for 2 people! Went home and had a chip butty, I was hank Marvin. Tiny portions, the pots of salad for 2 people were miniscual. Service excellent food very tasty.... Just needed more. great night out with 5 friends, we asked the waitress to choose our meals,as some of us hadn't been before. we had 7 different plates of food to share which was divine! the staff we amazing, very friendly and fantastic service. Great place for a casual dinner. The sharing plates are well presented and delicious. Staff are friendly and efficient. Drinks are a little on the pricey side. We were finished within 30mins so would have liked some time between dishes. Although the dishes were small we didnt go away hungry or wanting more. Glad we had a Grab One as I think dishes were dear for portion size presented. Food was delicious and unique. Please make it clear if you are a restaurant or a bar - we asked if hot drinks were available, and were told no because it is a bar.